Opening a couple of years after World War II, this novel centers around several connected characters. Kay works for a Christian Scientist, who treats his patients by trying to convince them their maladies are all in their heads. Helen and Viv are coworkers in a match-making agency. Helen is in a relationship with an author named Julia, while Viv is in a relationship with a married man, and the two women don't know these things about each other. Also a secret is that Viv's brother Duncan was in prison. He now lives next door to Kay. The second part of the book takes place a few years earlier in 1944, and the third part goes back even further to 1941. Waters has made some interesting choices with this timeline. For some story lines it means getting the emotional impact of an important reveal at the end, while for others it ends with the initial meeting bewteen two characters who have no idea what they will go through together, but we do. It's almost ant-climactic in a couple of the cases, but that's ok because more than one big reveal at the end would definitely be overkill. Before I started reading, for some reason I thought this was a less-liked Waters book and I wasn't expecting much. I have no idea why but I also thought it wasn't about lesbians. At any rate I was pleasantly surprised to find that I was wrong on both counts. In Goodreads ratings, it falls approximately in the middle, and there are definitely lesbians. I liked it not as much as Tipping the Velvet, but more than The Paying Guests or Affinity, maybe around the same-ish as The Little Stranger and Fingersmith. It's hard to say for sure since I read some of these so long ago. My edition was around 525 pages but didn't feel that long at all! Every time I sat down to read I'd become engrossed and would be surprised at how many pages I had read when I checked. As with her other books, she makes the setting feel so real, and every little thing about the characters and their lives came alive so vividly. I felt like I wanted more from all of them - I wanted to know more about their pasts, more about what happened between the events of the different sections of the book, and more about what happens later. That's not to say that anything was left out that should have been included, just that Waters makes me so invested in her stories that I can't really get enough. Long ago I swore off reading any other novels that take place during World War II so I feel a bit duped since I didn't realize that's when it took place. But I love Sarah Waters and had every intention of reading all her books no matter what, so the setting wouldn't have stopped me even if I had bothered to read anything about the book before I started it. When all is said and I done, I feel quite satisfied that I have now read all of Sarah Waters's novels. On the other hand, I feel a more urgent need for her to write another one so I can read it because I want more books by Sarah Waters! 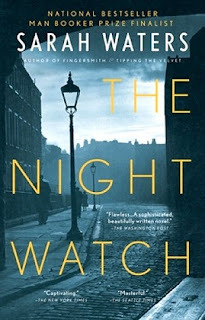 The Night Watch is the seventh completed book for my TBR Pile Challenge, which means I have only three left. I'm just as shocked as you are that I'm so far through this challenge so early in the year!